The word meme is the brain child of Richard Dawkins in his book The Selfish Gene, published in 1976, well before the Web and its semantic soup. The emergence of the ill-named “internet-of-things” has brought about a new perspective to Dawkins’ intuition: given the clear divide between actual worlds and their symbolic (aka web) counterparts, why not chart human culture with internet semantics ? Symbolic Dissonance: Flowering Knives (Adel Abdessemed). With interconnected digits pervading every nook and cranny of material and social environments, the internet may be seen as a way to a comprehensive and consistent alignment of language constructs with targeted realities: a name for everything, everything with its name. For that purpose it would suffice to use the web to allocate meanings and don things with symbolic clothes. Yet, as the world is not flat, the charting of meanings will be contingent on projections with dissonant semantics. 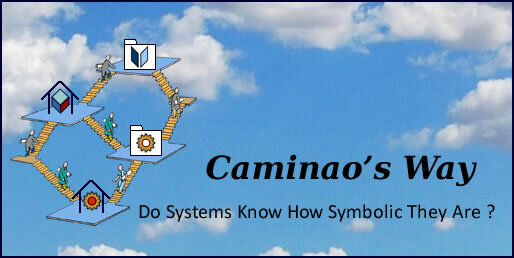 Conversely, as meanings are not supposed to be set in stone, semantic configurations can be adjusted continuously. Searches targeting reality are meant to return sets of instances (objects or phenomena) meeting users’ needs (locations, people, events, …). Searches targeting information are meant to return documents meeting users’ interest for specific topics (geography, roles, markets, …). Looking for information or instances. Interestingly, the distinction between searches targeting reality and information is congruent with the rhetorical one between metonymy and metaphor, the former best suited for things, the latter for meanings. 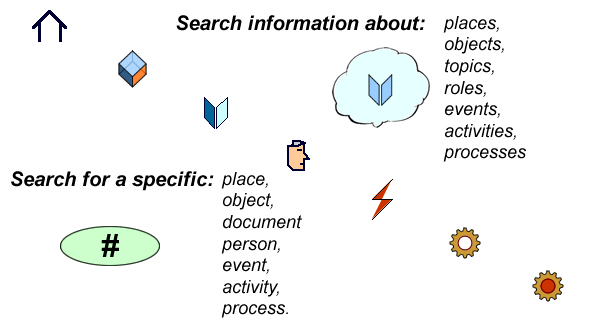 As noted above, searches can be heeded by references to identified objects, the form of digital objects (sound, visuals, or otherwise), or associations between symbolic representations. Considering that finding referenced objects is basically a technical problem, and that pattern matching is a discipline of its own, the focus is to be put on the third case, namely searches driven by words. From that standpoint searching the web becomes a problem of rhetoric, namely: how to use language to get rapidly and effectively the most accurate outcome to a query. And for that purpose rhetoric provides two basic contraptions: metonymy and metaphor. Both metonymy and metaphor are linguistic constructs used to substitute a word (or a phrase) by another without altering its meaning. When applied to searches, they are best understood in terms of extensions and intensions, extensions standing for the actual set of objects and behaviors, and intensions for the set of features that characterize these instances. Metonymy uses contiguity to substitute target terms for source ones, contiguity being defined with regard to their respective extensions. 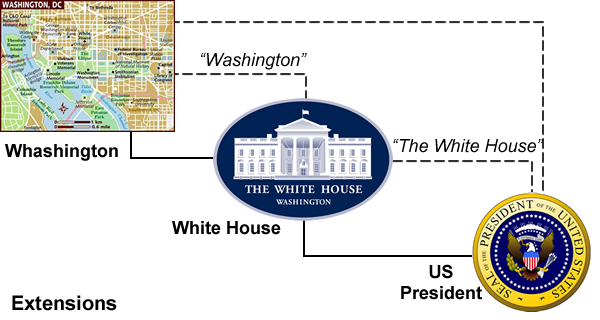 For instance, given that US Presidents reside at the White House, Washington DC, each term can be used instead. Metaphor uses similarity to substitute target terms for source ones, similarity being defined with regard to a shared subset of features, the others being ignored. Hence, in contrast to metonymy, metaphor is based on intensions. Metonymy will be used to navigate across instances of things and phenomena following structural, functional, or temporal associations. 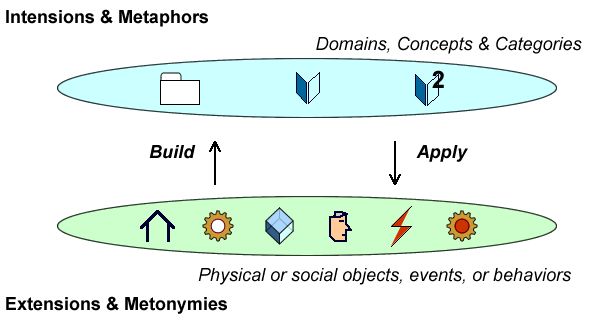 Metaphors will be used to navigate across terms and concepts according to similarities, ontologies, and abstractions. As a corollary, searches can be seen as scaffolds supporting the building of meanings. Today general purpose search engines combine brains and brawn to match queries to references, the former taking advantage of language parsers and statistical inferences, the latter running heuristics on gigantic repositories of data and searches. Given the exponential growth of accumulated data and the benefits of hindsight, such engines can continuously improve the relevancy of their answers; moreover, their advances are not limited to accuracy and speed but also embrace a better understanding of queries. And that brings about a qualitative change: accruing improved understandings to knowledge bases provides search engines with learning capabilities. 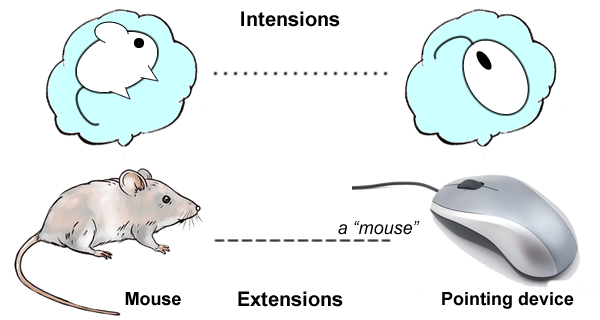 Assuming that such learning is autonomous, self-sustained, and encompasses concepts and categories, the Web could be seen as a semantic incubator for the development of meanings. That would bear out Dawkins’ intuition comparing the semantic evolution of memes to the Darwinian evolution of living organisms. I’m not sure: combined with smartphones and social networks, internet eliminates any mediation (time and cognitive process) between language items and their meanings.﻿ But what if Intelligence is to be found in that very mediation.